Find out what our experts have to say about TVS Victor! The least priced variant is TVS Victor Drum priced at Rs. 65,678 and the most priced variant is TVS Victor Premium Edition priced at Rs. 68,882. Choose the TVS Victor which fits the bill of you. TVS has many firsts in the two-wheeler segment in India, and one of them has been to indigenously develop a four stroke, 110cc engine motorcycle in India, the TVS Victor. The bike when launched didn't garner much sales, as expected. But when TVS made Sachin Tendulkar the brand ambassador for the Victor and he started endorsing it, the sales figure went through the sky. As many as 40,000 units were being sold a month which was very staggering. But as years passed, the sales declined very much due to the build quality, durability and after sales issues plaguing the bike. TVS tried to revive the Victor by launching it in various avatars and engine capacities. But that didn't work and the sales kept falling. TVS decided not to pursue the Victor any further and finally discontinued it in 2007. 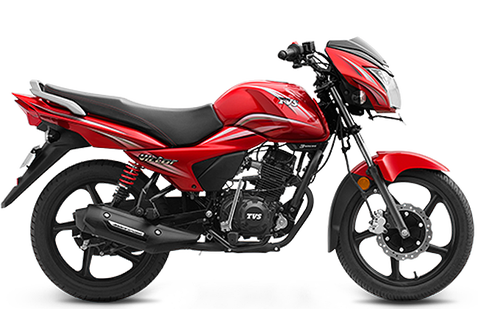 Now come 2016, TVS once again tried to tap their most-successful commuter bike and reincarnated the popular brand which managed to put a dent in sales of the market leader, Hero MotoCorp. The Victor now dons a more contemporary look, with a new instrument cluster, new headlight & tail light, and stubby exhaust. This premium commuter again challenges the heavy weights like the Hero Splendor, Bajaj CT 100 and also the Honda Dream series. TVS Victor is available in 3 variants like the standard drum variant priced at Rs.53295, then the disc variant priced at Rs.55295 and finally the special edition Premium variant which retails at Rs.56275. All new TVS Victor looks stunning with good built quality and is packed with features to make it a value for money proposition. One of the best looking bikes when it was first launched in 2001, the new avatar still looks very attractive and prominent. In terms of looks no one in the segment can match it. Headlamp is very big as well as stylish and the black visor gives it a premium look. Pilot lamps are ingrained in the headlamp and the only other bike in this segment that has this feature is the Hero Passion X Pro. With a chiseled fuel tank and premium paint job, the overall decal graphics enhances the look of the bike. This executive commuter has all its side and rear panels properly laid out. With a sporty exhaust note, the stubby exhaust goes well with the entire design of the bike. Rear clear lens turn indicators along with the LED tail light look fabulous. Seat is long, comfortable and is one of the best seats available in this segment. TVS has provided the bike with semi-digital instrument console which looks very premium for this segment and has the analog tachometer as well as a speedometer, odometer, 2 trip meters and a fuel gauge in the digital display screen. The new graphic decals and new DRLs makes this bike very exclusive. Whereas, golden clutch cover, chrome garnish on the headlight and the side panels lend this bike a premium look. The seat cover too is given a dual tone touch which makes it look more attractive. Different colours are available for this executive commuter bike. Drum and disc variants are available in Blissful Blue, Generous Grey, Beatific Black Silver, Serene Silver, Restful Red and Balanced Black Red colours, whereas the Premium variant comes in Matte Blue, Matte Silver and Black Gold colours. Powering this executive commuter is the first in segment 109.7cc, air-cooled, 3-valve, O3C engine. This engine belts out a max power of 9.5PS at 7500rpm and a peak torque of 9.4Nm at 6000 rpm. These figures make the bike most powerful in its segment and is clearly evident when you ride the bike. With a refined engine, the TVS Victor is very smooth and accelerates easily even with a pillion on the rear seat. Engine is now BSIV compliant and is mated to a 4-speed gearbox with constant mesh. Fuel tank capacity is a measly 8 litres including the 2 litres for reserve. Even with these amazing power and torque figures the bike gives a claimed mileage of 72kmpl. Top speed of the Victor is capped at 90kmph. With a refined and powerful engine in its segment, the bike feels smoother even if revved harder. With a shorter wheelbase, the TVS Victor is very agile and easy to maneuver in the city traffic. Victor gets the same Series Spring suspension setup that was first seen on the first generation TVS Phoenix which is no longer in production. This amazing 5 step adjustable hydraulic series spring suspension at the rear paired with a telescopic oil damped front suspension gives a supreme ride quality which is best in class. And with a class leading ground clearance of 175mm coupled with this amazing suspension setup, makes riding a breeze even on potholed roads. Braking power is given by an optional 240mm disc brake or 130mm drum brake at the front and the rear gets a 110mm drum brake as standard. All new TVS Victor rides on 17-inch 5-spoke alloy wheels covered in 2.75- inch thickness tubeless tyre in front and same as Bajaj CT100 3-inch wide tyre on the rear. Highly efficient headlights coupled with DRLs on the Premium variant improves the overall visibility, which makes riding in extreme conditions easy. The bike is also equipped with a hazard light switch which looks like a engine kill switch and proves to be very useful to alert the traffic during foggy conditions or if the bike breaks down in the middle of the highway. TVS Remora tyres provide adequate grip and the optional disc brake enhances the safety level as well. The bike features a Eco/Power indicator which shows whether the bike is ridden powerfully or economically to gain more mileage.